Most luxurious of the Chrysler UK's 1725 c.c. 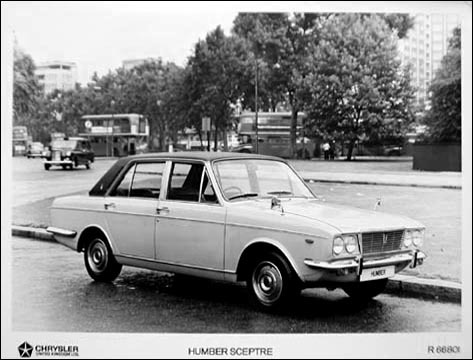 four-door saloons, the Sceptre is the only Humber made today. With four-headlight treatment, special wheel embellishers, luxury trim, and engine to Sunbeam Rapier tune, the Sceptre is fast as well as comfortable and prestigious. It is capable of more than 95 m.p.h., yet with day-to-day driving will return fuel consumption figures of around 33 m.p.g. Servo assistance is standard equipment for the disc/drum brakes as is the overdrive on top and third gears of the all-synchromesh four-speed box. Borg-Warner automatic is extra.